Hi Everyone! Yes, I know, it has been quite some time since my last post but I figured “absence makes the heart grow fonder” and this way you just may be excited to read about my latest happenings!! So much has happened since my latest update, where to begin! 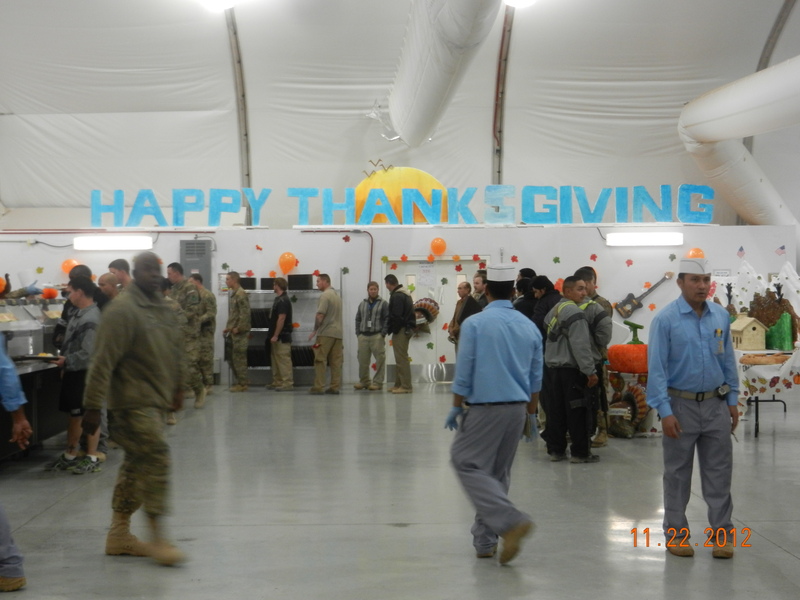 Spent a lovely 8 day holiday break at the end of October in Bagram and Kabul — yes, I vacationed in Kabul! Who can say they have done that?? It wasn’t all fun and games b/c I was there for Professional Development — for only 3 days! The other 5 days were spent traveling from my lovely base to Kabul, and then on to Bagram to get home! Guess what happened though for a lovely 3 days — you got it, stuck in Bagram — manifested on a flight, flight cancelled; try again…make it on board, fly for an hour, and oops, must turn around due to bad weather and not able to land — aargh!! Try again two days later, and wahlah, home sweet home! It’s hard to imagine but I was extremely excited to be back at my own compound with my own things and my own bed!! Thanksgiving was bittersweet b/c even though I was able to spend it with Francine and a few of the many friends that we have made here, I wasn’t able to have everyone over to my place to enjoy a great tasting feast, play Scrabble and/or Rummikub, watch a football game, and enjoy a few adult beverages! (damn, I miss that! ) 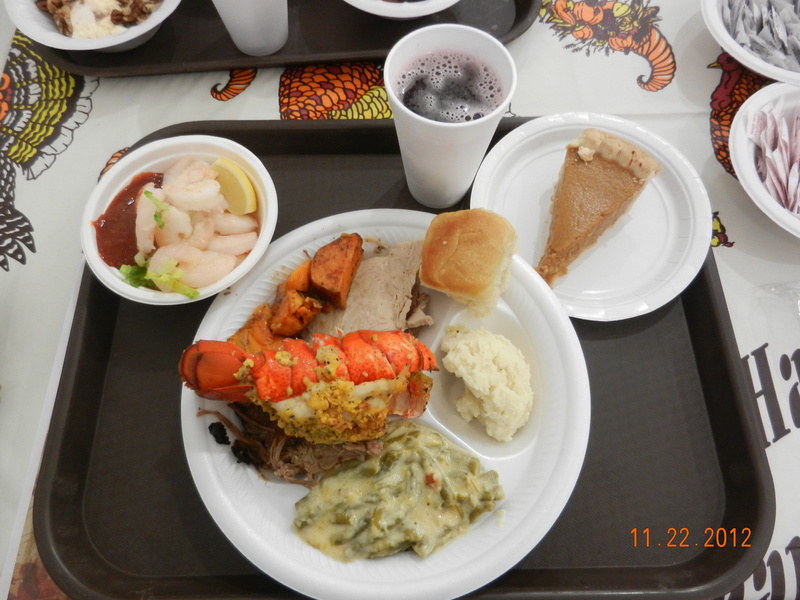 I must say that the Dining Facility provided a great Thanksgiving meal for all of us — as you can tell from the pictures below!! Yes, they made green bean casserole, LOBSTER, sweet potatoes to perfection, pumpkin pie (minus the cool whip for some reason), and shrimp cocktail to boot! My goodness, check out my plate! We even had sparkling wine and egg nog! One thing was missing, leftover turkey sandwich during halftime of the Dallas game. There is always next year :-). Three months ago we had graduation for the second class of 15 pilots and tomorrow is graduation for the third class! Very excited to say that 13 students are moving on to pilot training, while 26 will continue in the intensive English program. We’ll receive a about a dozen more in the next two weeks to join us, too! Tomorrow morning they will receive their diploma and on Saturday, the graduates begin training for their new flying career! So proud of the students and look forward to meeting my new students that I will have for the next 3 months! Will update soon about graduation and my new students. Thank you all so much for your supportive emails and care packages! I appreciate all you do to make this experience a bit more enjoyable! !